translation of the title into English would be “Underworld, World and Overworld”). Probably written by Helena P. Blavatsky, the following anonymous review was first published in her “Lucifer” magazine, in London, May 1889, pp. 262-263. Portuguese theosophist Viscount de Figanière (1827-1908) was a friend of HPB’s and likely a member of her Esoteric School, which can be inferred by perusing the bibliography he indicates in “Under, In, And Above the World”. With 744 pages besides the opening pages and Summary, the book is now available in our associated websites under its title “Submundo, Mundo, Supramundo”. On Chapter 21 of his work, Figanière makes an accurate approach to the relation between Masters, disciples and aspirants to discipleship. In more than one aspect “Submundo, Mundo, Supramundo” is comparable to the works “Esoteric Buddhism”, by A. P. Sinnett, and “Man: Fragments of Forgotten History”, by “Two Chelas”. Like these two books, it is previous to “The Secret Doctrine” and yet gives the reader a description of the cycles of rounds, races and globes, a central topic in discipleship. Figanière first saw “The Secret Doctrine” published in paper while his own book was being printed. That Figanière was not a beginner in occult studies is seen by the way HPB refers to him and quotes from him in “The Secret Doctrine”, vol. II, p. 289, fn, and p. 290. However, he was glad to correct his views whenever they differed from those of HPB and her Masters. Figanière lived several years in Brazil. As a diplomat, he represented Portugal in Russia for approximately seven years. He had a number of articles published in “The Theosophist” and “Lucifer”, and wrote books with essays and novels in English, French, and Portuguese. His full name is Frederico Francisco Stuart de Figanière e Morão. Readers can see two lengthy articles by him in the collection of “The Aquarian Theosophist”. One of them, entitled “Is Theosophy Pantheism?”, in the May 2003 edition, pp. 1-15. The other one, “About the Ego and the Unmanifested Being”, is in the July 2002 edition, pp. 13-22. At the time “The Aquarian” was published from Los Angeles by its founding editor Jerome Wheeler. The author is a Grand Cross of the Order of St. Anne, in Russia; was Envoy Extraordinary and Minister Plenipotentiary from Portugal to Russia 1870 to 1876, and like a noble-minded man, places his Fellowship of the Theosophical Society above these dignities. When this work was as he tells us, ready for publication in December last, the “Secret Doctrine” appeared, and a “fresh light” thrown on the subject. The alterations he has made are embodied in a supplementary chapter of 40 pages, which appears to convey a clearer abstract of the Secret Doctrine, and a more systematic review than has yet appeared in Europe. The work, treating as it does of topics which form the ground-work of Theosophical teaching, cannot be reviewed in these pages at the length it probably deserves. A propaedeutic work is necessarily didactic in its character, and the author who lays down certain general propositions has given in all cases the sources of his information. The first part is devoted to Evolution in general, comprising metaphysics, ontology, and cosmogony. The second part to human evolution. The genesis of the first, second, third, fourth, and fifth race is described. Chapters follow on the Origin of Language, on Kama-loka, Avitchi, and Devachan. The definition and modes of operation of the law of Karma are given in detail. The eighth sphere, the manvantaric manifestations, free-will, the periodic cycles, the sixth and seventh race, the occult hierarchy and the history of the Theosophical Society form each separate chapters. We refrain from offering at this time an analysis of each of these, and content ourselves with saying that the work is copiously illustrated with diagrams, and is one of the most scientific manuals of Theosophical literature that has yet appeared. Portugal may well be proud of so eloquent an expounder of elementary truths in such nervous language, and after our bitter experience of English literature on the subject, it is a relief to read any work written by an exact mind in clear language. We must also notice how this book contrasts with the Spanish spiritist productions, and it will be seen that the learning and elegance of the author have induced him to compile one of the most important contributions to modern Theosophical literature. 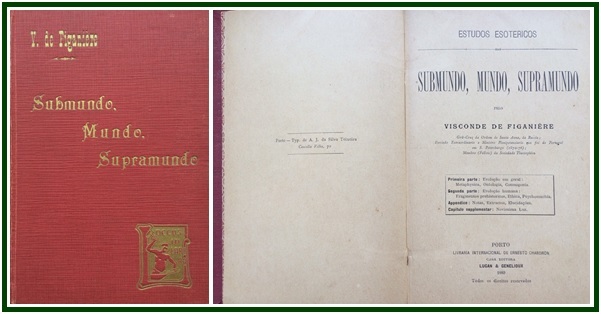 Readers of our associated websites can have access to the complete facsimile online edition of “Submundo, Mundo, Supramundo” (“Under, In, And Above the World”). In order to see the book, it is enough to click for instance Here or Here. A more accurate translation of the title into English would be “Underworld, World and Overworld”. The above text was also published in the June 2016 edition of “The Aquarian Theosophist”, pp. 16-17. Its Editorial Note was updated in April 2017.